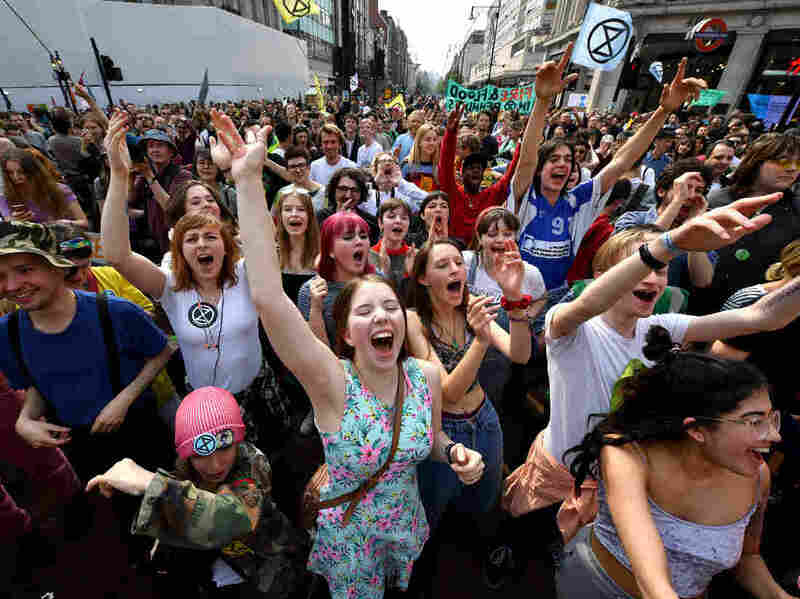 Climate Protests Disrupt London For 3rd Day Activists occupied four of London's landmarks and thoroughfares and, on Wednesday, targeted the city's rail service. The organizers want a zero-carbon Britain by 2025. 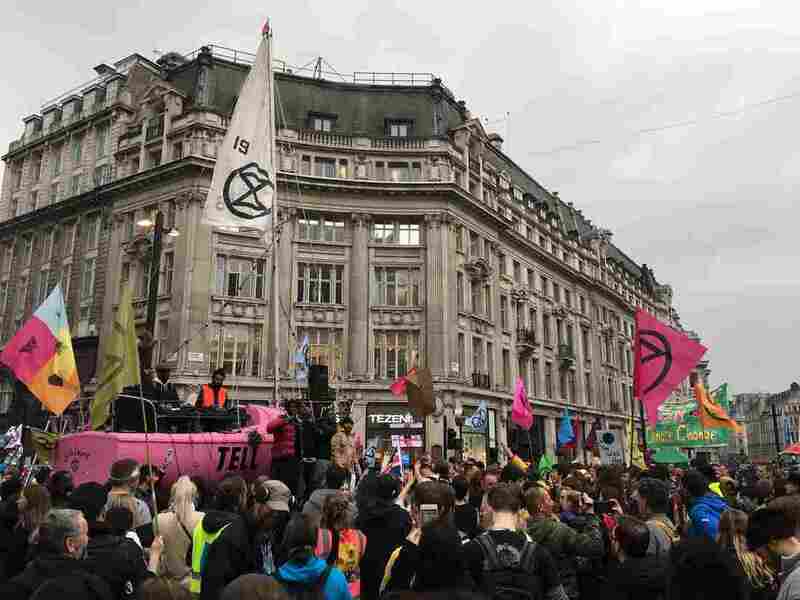 Activists call for government action on climate change in the middle of Oxford Circus on Wednesday in London. Now in their third day of action, protests have blocked a number of key junctions in central London. Activists occupied four of the city's landmarks and thoroughfares: Oxford Circus, Marble Arch, Waterloo Bridge and Parliament Square. The actions closed 55 bus routes and affected a half million people, the Metropolitan Police said Tuesday. Police have made about 300 arrests since protests began Monday. 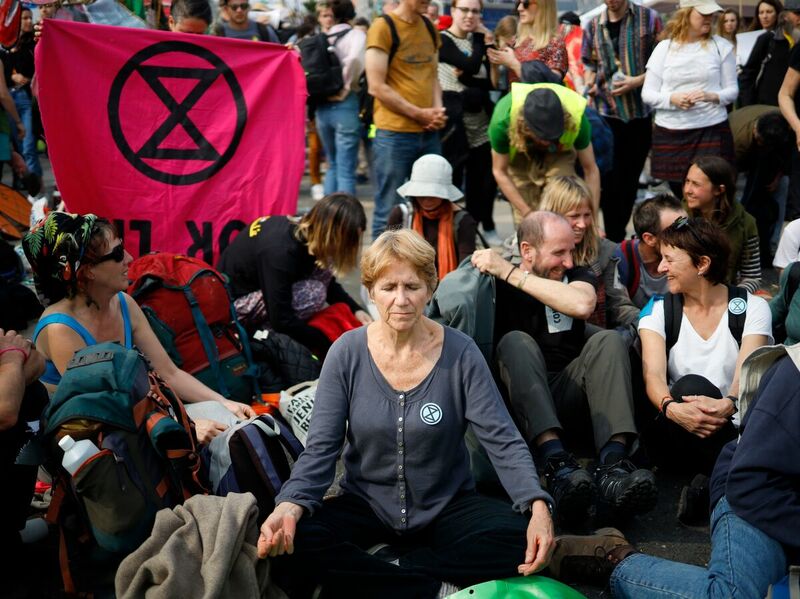 Extinction Rebellion is the group behind the protests, and on Wednesday, it called for light disruption to the city's rail service. Two activists climbed onto the roof of a train in the Canary Wharf district, unrolled a banner that said "Climate Emergency – Act Now" and glued their hands to the top of the train. Authorities climbed up, applied solvent to the activists' hands to unstick them, and lowered them from the roof in harnesses. At Waterloo Bridge the day before, police worked to remove protesters who were glued or locked to a truck blocking the road. 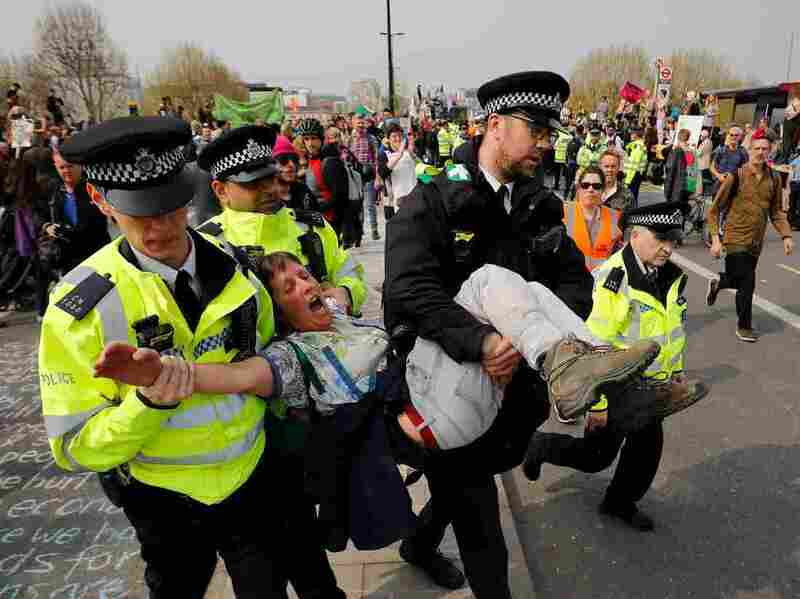 Police arrest a climate change activist near Waterloo Bridge in London on Wednesday. Authorities have made about 300 arrests since protests began Monday. In Oxford Circus on Tuesday, the scene was like a giant political street party. A pink sailboat was parked in the middle of the intersection, from which people made speeches and rappers performed to crowds of protesters and onlookers. "I couldn't miss it. I just have to be here," said Alice Spearman, 18, who traveled from Hereford, southwest of Birmingham. She's a high school senior who has participated in school strikes over climate change, and she had the words "Action Now" written on her forehead. "The government are not taking this seriously," she said. "We need people to acknowledge that really we are in a climate emergency, and it's only going to get worse. I am very scared for my future." David Gillam is Herefordshire coordinator for Extinction Rebellion. He said the group's aim is a zero-carbon Britain by 2025 — a goal "which means reducing our emissions very seriously, very rapidly." Reaching that target would require Brits to make real changes in their lives, he said. "We would probably have to eat a lot more local foods. Things would have to be grown locally and not brought from such a distance. Certainly people would probably have to fly less." A pink sailboat at a tent camp blocks traffic in London's Oxford Circus on Tuesday. Protesters chose a sailboat to illustrate the threat of rising waters. They want Britain to reduce greenhouse gas emissions to net zero by 2025. Nearby, Barry Nash leaned against a stoplight, watching the protest. He manages drivers who deliver industrial parts in the area, but he sent them home because the protests made driving impossible. Nash said he generally supports the protesters' goals but not their methods. "I understand the reason why, but it affects a lot of us everyday people that are just trying to earn a living," he said. "If I was outside your house and I stopped you from going to work, would you get upset with me? Yes, exactly." Activists occupied four of London's landmarks and thoroughfares: Oxford Circus, Marble Arch, Waterloo Bridge (pictured above) and Parliament Square. London Mayor Sadiq Khan says he fully supports the protesters' right to demonstrate on climate. "We do face a climate emergency. The government's been too slow to act," he told the BBC. He urged the organizers to work with police to minimize disruption. And he worried about the demonstrations disrupting the city's trains and buses — key tools to fight climate change. Public transport is "what we're going to be encouraging people to use when we face a climate emergency," Khan said. "And I am worried about protesters targeting public transport because I'm trying to encourage more and more Londoners to use public transport because it's good for the environment."